Our new website has been lunched. Since 1984 Azmoon Saz Mabna has been a leader in providing high quality construction laboratory equipment and supplies in IRAN and Middle East. An experience of more than three decades has provided us with a vast knowledge and technical know-hows of this industry. From the very beginning, Azmoon Saz Mabna has focused on quality and cost control. Our products are manufactured according to the international and local standards like: ASTM, BS, DIN, and Iran National Standard ISIRI in construction materials. We have employed best technicians and engineers from the industry to manufacture our equipment. Azmoon Saz Mabna designs special testing systems and devices to be used in quality control and R&D activities alongside its mass production line. We have own in house R&D department, which further modifies and develop new methods to make our equipment smarter and better. Beside this we have team of well qualified & experienced technicians on our production line to ensure prompt and effective services for our respective customers for installation, training & demonstration of equipment. Also all Azmoon Saz Mabna products are tested to guarantee quality, reliability and performance, backed by the international standards and warranties. Today Azmoon's factories with a surfaces over than 4000m² with 80 experienced staff provides the needs of construction companies that carry out worldwide projects, private laboratories, universities and state institutions such as mineral research and exploration, road and highways, environment and city planning or hydraulics, irrigation and hydrology departments, etc. 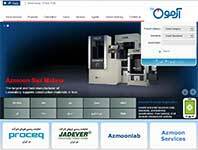 The success of Azmoon Saz Mabna can be attributed to the company philosophy of providing quality use and refurbished laboratory equipment for a fair price, as well as, value – added service and support. All rights reserved by Azmoon Industrial Group.